The IFTA Film and Drama Awards ceremony takes place on 15th February in the Round Room of the Mansion House in Dublin. 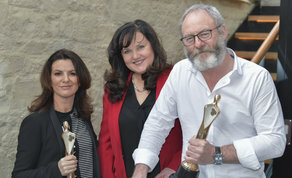 The nominations were announced at a press launch this morning at 9 Below on Stephens Green, where Deirdre O'Kane and Liam Cunningham along with IFTA CEO revealed the nominations and details about the upcoming Award Ceremony in Dublin. The Irish Film and Television Academy commences its 15th anniversary year with the announcement of a superb line-up of nominations for the 2018 Awards that reflects a vibrant and successful Irish home industry. Across the Film categories Maudie receives 6 Nominations, Cardboard Gangsters and Handsome Devil along with Three Billboards Outside Ebbing Missouri and The Farthest each receive 5 nominations. The Drummer and the Keeper, The Killing of a Sacred Deer, Maze and Michael Inside each receive 4 nominations. The Lodgers and Pilgrimage and Song of Granite all receive 3 nominations each and Ladybird is nominated in its two categories. The Academy CEO, Aine Moriarty commented: “What a fantastic kick-start to the Academy’s 15th Anniversary year with this superb line-up of Irish Nominees showcasing the very best of Ireland’s creative talent, delivering world-class film and drama across the globe. The Academy looks forward to acknowledging their achievements and rewarding excellence at the IFTA Awards Ceremony next month (Thursday, February 15th).